That’s how A Lady of Gettysburg, Pennsylvania, started the introduction to her journal entries when they were prepared and published in 1864. Though at the time of publication she disguised her real name in typically mid-19th Century feminine fashion, historians decades later are fortunate that she kept a detailed record of her civilian experiences during the Battle and Aftermath of Gettysburg. Her real name? Sarah Broadhead. Mrs. Broadhead’s courage and writings influenced my research and writing, and she is definitely one of my favorite historical persons from the Civil War era. 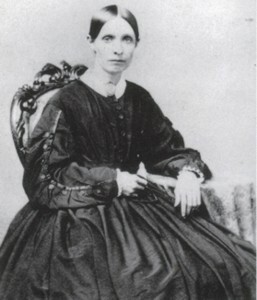 In her early thirties in 1863, Sarah Broadhead and her husband, Joseph, lived in Gettysburg, Pennsylvania which was an average county-seat town during the first half of that year. The war seemed a safe distance away, and life was good for the young couple. They lived with their four-year-old daughter, Mary, in a comfortable two-story, brick home at 217 Chambersburg Street in town and not far from the Lutheran Seminary. Joseph worked for the railroad line between Gettysburg and Hanover and served as a lieutenant in a local militia unit while Sarah. 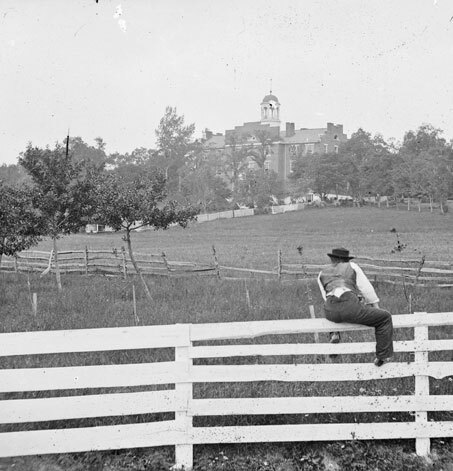 She continued to keep a daily record of rumors, false alarms, and thoughts as the days passed, giving historians and interested readers a glimpse into the “real-time” thoughts and feelings of a Gettysburg lady. This is especially helpful for research; while many Gettysburg civilians wrote down their experiences, most tended to write what happened after it had happened – sometimes a long time afterward. Thus, those civilians wrote their stories after Gettysburg battle and sometimes after Gettysburg took its place as a decisive battle in American History books, giving folks a chance to add hindsight or extra color to their stories. Sarah’s journal is “real-time,” meaning she wrote what happened pretty much as it occurred which provides a different recorded experience. She about the elements of fear, suspense, and unknown dangers. And she recorded it beautifully; her former experiences as a school teacher gave her better spelling and a good vocabulary to explain the happenings in her town. The following day – July 1 – was baking day for Sarah. She had just finished preparing her bread to go in the ovens when she heard cannons. “What to do or where to go, I did not know.” She experienced the Battle of Gettysburg from the shelter of a cellar, coming above ground during lulls in the fighting to cook for her family. Her impressions of the battle were quite different than those of the generals and soldiers, but her writing revealed her thoughts and fears for those on the battlefield. The Lutheran Seminary in the distance. Sarah volunteered to take care of wounded soldiers at the Seminary after the battle. The following year Sarah privately published a pamphlet form of her journal, donating seventy-five copies to the U.S. Sanitary Commission for a fundraiser fair. In later years, Sarah and Joseph moved to New Jersey, Sarah’s original homestate. Joseph Broadhead died in 1903, and Sarah lived with her daughter in Pennsylvania until her death in 1910; Sarah is buried in Pleasantville, New Jersey. Sarah Broadhead kept a journal with the purpose of recording events to ease her own anxiety about the 1863 invasion of Pennsylvania. In the end, she left a valuable historical source, allowing historians and readers to glimpse what it was like for a Gettysburg civilian wife and mother, living in the town during the battle and aftermath days. Her perspective is insightful and, although not likely to be of much use while researching about troop movements, it provides a startlingly clear glimpse into the meaning and reality of the battle. In closing, here is Sarah’s account of the afternoon of July 3, 1863 – the hours leading to and completing the Confederate charge by Picket, Pettigrew, and Trimble. She did not see the battle lines, but she still had a clear report and idea of what was happening. Thankfully, she wrote it down. This entry was posted in Battles, Civilian, Primary Sources and tagged Battle of Gettysburg, Civil War Civilians, diary, favorite17, Gettysburg, gettysburg civilian, joseph broadhead, journal, mary broadhead, Pickett's Charge, Pickett-Pettigrew-Trimble Charge, sarah broadhead. Bookmark the permalink. Thanks, Jeffrey. Her journal has a wonderfully real and emotional quality to it. She was not a panicky woman, but she certainly thought a great deal about what was happening around her and could sympathize/empathize.